Lachmann zeros in on Weber's understanding of the role of institutions in society. Ludwig Lachmann took a strong interest in the history of economic thought, particularly as it pertained to methodology. While he would not have claimed to be an Austrian in the Misesian tradition, his writings have influenced Austrians. 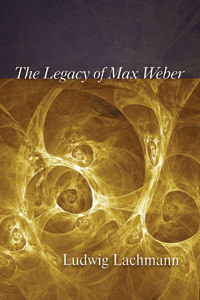 Here is his study of the methodological and political legacy of Max Weber, who himself influenced Mises's own methodological perspective. Lachmann zeros in on Weber's understanding of the role of institutions in society.